<?xml:namespace prefix = st1 ns = "urn:schemas-microsoft-com:office:smarttags" />Hoh Xil, China's highest altitude nature reserve, is likely to be overrun by livestock in 10 years, Chinese scientists warned Tuesday. "More than half of the Hoh Xil Nature Reserve -- 27,000 square kilometers -- has become pasture," said Ding Lin, a researcher at the Institute of Tibetan Plateau Research with the Chinese Academy of Sciences. 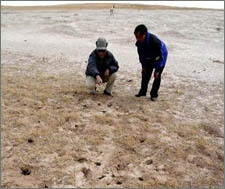 Ding, a member of scientific expeditions in Hoh Xil in 2005 and 2006, said the number of livestock was still increasing rapidly. Early reports said hundreds of herdsmen with more than 40,000 sheep and 7,200 cattle had settled in the reserve. Some herdsmen even settled near the edge of the glacier from which China's longest river, Yangtze River, originates. Ding said grazing activities had driven wild animals from their traditional habitats and threatened their survival. "Even in the central areas of Hoh Xil, where there was abundant water and grass, we hardly saw any wild animals for a entire morning," Ding said. The grazing had also destroyed the Hoh Xil's fragile ecosystem. "With the decrease of wild animals, mice reproduced rapidly, which seriously damaged the region's vegetation and soil," Ding said. The environmental deterioration would have a significant impact as the region was the source of many of the major rivers in China and Asia. Moreover, if desert encroached on the region, sand would enter the convection currents, given the high altitude, and "fly" over oceans and continents to many countries, Ding said. The government should recognize the severity of the problem and take effective protective measures, he said. He said the Hoh Xil Nature Reserve could be opened to a limited extent. "But the core area of Hoh Xil must be strictly protected (from pasturing), otherwise we will suffer irrecoverable losses."